Yesterday we ruminated about the nature of self, and how that relates to the organism's sense of self, and to an observer's ideas about what the organism's sense of self might be. We can pontificate about what exists, or doesn't, but ultimately we are unable to go beyond what someone reports or our definition of self. If an ant is not conscious, in our sense, does it have a sense of 'self'? And if a person has consciousness, can s/he really have a sense that s/he has no self? Speaking of rumination, let's ruminate a bit about the ruminant and its position in life. 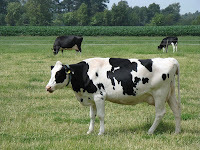 The cow or bull or steer must view the world from the position of its 'self'--whatever that means in bovine experience. As with any individual, in any species, at any time, it strives to survive, and that 'striving' is genetic in the evolutionary sense and need have no element of consciousness. So by giving lots of milk or growing tasty meat, cattle are thriving evolutionarily. Yes, beef cattle are killed, but we all die eventually, and by the subtle trick of offering themselves up to be killed (again, it's the act not the awareness that matter in evolution), cattle genes have incredible, almost unprecedented fitness! With our inexcusable human arrogance, we'd say no, this is artificial not natural selection. From our point of view, that's true: we are choosing which bovine genes are to proliferate. But the bovine genome is fighting back, offering up genetic choices for our favoritism. More importantly, from the point of view of cow- or beef cattle-selfs, it doesn't matter what's doing the choosing: the climate, the predators, or the agronomist. However cattle got to be here, they are here, and as long as the environment (that is, McDonald's and Ben and Jerry's) stays favorable, cattledom will thrive. But from the cattle's selfness perspective, it doesn't matter whether its the breeder or the weather that leads it to be so successful. When we enter the Vegetarian Age, things may change, but so do they always for every species in changing environments. The real difference between how cattle got here and how monarch butterflies got here is that we presume there is no conscious hand guiding 'natural' selection, whereas there is one (us) guiding 'artificial' selection. But there are long-standing discussions about the extent to which our past evolution channels our future--'canalization' is the classical word for this, making it somewhat predictable. Evolution can only mold things in directions that viable genetic variation enables. If a species' biology and genomes are so complex that only certain kinds of genetic change is viable, then there are only so many ways it can change. That is not a conscious hand, but from the organism's viewpoint, it's not so completely different from artificial selection. So in that sense it's we who make a distinction between our guiding hand and Nature's. It may be worth ruminating about this, just for the fun of it, because it's a kind of human (self-)exceptionalism by which we create a difference, in our own minds, about how natural change comes about. But 'in our own minds' means a distinction that is the result only of our own selfness. And we tend to deny selfness to any other species. What would all of this look like to the proverbial Martian, whose assessment machinery may bear no resemblance to 'consciousness' and who thus may not see us as being so separate from the rest of Nature's clockworks? Good one, and, "food for thought". Yes, our dietary habits provide an unprecedented bonanza for many species. In a somewhat opposite way, lions eating gazelles keeps the gazelle numbers down to what the grassland can support. Yet, by there being not so many gazelles, gazelles survive! Thank you. Now I will feel less awkward and alone as I reluctantly sputter out the words "artificial" selection to students and then clumsily explain why it's not necessarily any different from "natural" selection. Also, I'd love nature programs (like Nature) to stop describing areas as "the wild" just because they're free of any humans.